RHS exhibition: twelve weeks to go! I have my work cut out to get my six pictures ready for the RHS botanical art exhibition during the Orchid show in April. The series of six crab apple trees is well on the way. The apples are painted in all six pictures. 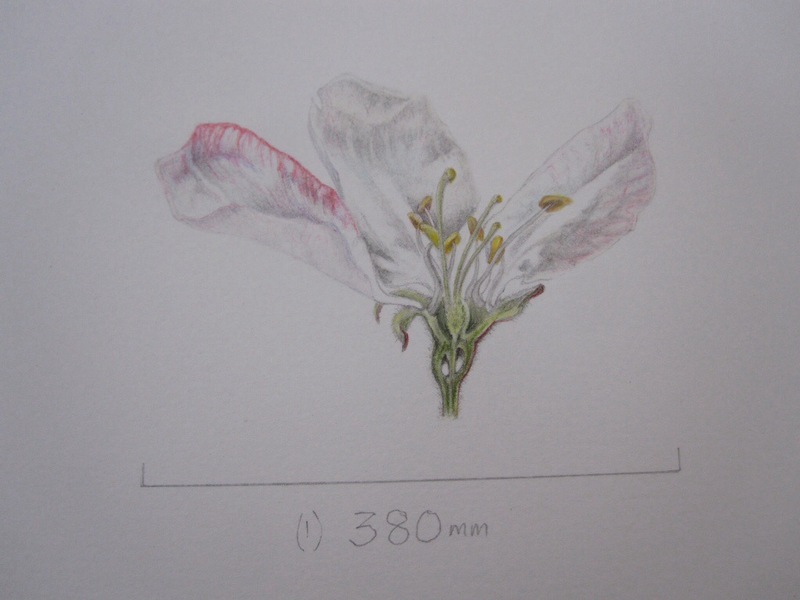 I have done all the sketches and colours for the blossom ( done two years ago); all the sketches for my dissections were done last year; all of the apple dissections are sketched and ready to go. It is now a matter of putting it altogether in the finest detail and with my best techniques. I have just completed the first picture. It is the Malus ‘ gorgeous’. I will give you a little glimpse at the end, but to see the completed picture I will encourage you to come to the RHS exhibition itself. I will ask for one bit of help though. I need to include the Latin names for each of my apples and I can’t find all of them. If you know them, please let me know. The pictures will be, M. Gorgeous, M. Golden hornet, M. Evereste, M. Red sentinel, M. Red jade, & M. John Downey. I’m afraid that this photo is not too brilliant – a little dark. Even more reason to see it in real life. Just pray I get all the pictures finished and retaining a good standard.